After an outdoor concert this weekend, we were treated to fireworks, but since it was a surprise, I wasn't ready with tripod, etc., so most captures failed. I thought these twinkly ones looked like little magical creatures. For those who liked the shot of turkeys on the beach...imagine our surprise when this same family of turkeys walked across our deck, with the mom looking in the screen door, right at Jim, then turning to amble on into the yard and out of sight! Of course, my camera was not close enough to grab and capture it. This is magical, Taffy! What a fun capture! I love the lighthouse in the distance and the blue sky. How great! If I hadn't read what you wrote about this, I would have thought you'd added those wonderful little twinkles ETSOOI. It's going in my favorites. @pflaume Thanks Lisa! I appreciate your comment and your fav. I love this lighthouse and have gone to photograph it several times but haven't liked any of them. It was fun to be able to feature it here. A thousand Tinkerbells! This is so whimsical! I love it! Beautiful....worked out perfectly!!! They do look like fairies! Nice shot and sounds like fun! Awesome about the curious turkeys too! They were just "checking in" on you!! FAV capture Taffy! This is awesome and so creative!! Love it!! Great shot. It looks like fireflies to me are flying around the lighthouse. Very cool capture. Baby fireworks... newly born. Very sweet. I really like the rich blue of the night sky and the silhouette of the lighthouse. Lovely summer shot. Truly a beautiful capture, Taffy! The fact that you were able to get this image handheld is very good. Fav! Great result from your 'unprepared' capture. The lighthouse really gives a focal point of those lovely twinkling bits. Delightful. Magic shot Taffy, all those fairies just floating around waiting with wands at the ready. The lighthouse visually counterbalances the sparkly fairies very well. It's a great composition, imaginative and full of interest. As for the turkeys, what a shame, that must've been a wonderful sight to see. Lucky you. @golftragic Good things happen to nice people! Wow, you did really well here getting this without a tripod...at .25s! Your composition is fantastic with the inclusion of the lighthouse (even though it shows some camera movement). Beautiful and skilful! Well done! Gorgeous. Really striking against the blue background. This is gorgeous Taffy!! It really does look like a magical kingdom with that lighthouse and the twinkling lights! Great capture.....and, a big FAV!! Beautiful capture...they do look like fairies. Beautiful and magical image! Fav. They created a magical effect. Lovely shot. Seen lots of pictures of fireworks, but this is unique. Love the lighthouse. Do you think the Turkey was checking you out? Love the deep blue with the lighthouse. I agree..magical. Fav! This is just so wonderfully magical! Absolutely looks like fairies. fav. Love the surreal feel. Great capture! This is a great capture. It's a shame you didn't have the tripod. Great title too. Oh wow, I love this! Love the idea that they are fairies! Such a wonderful capture! Love the deep blue of the sky! Stinkin' incredible, my friend! Love this. fav! This just looks magical! A fav for sure! Glad you forgot your tripod - this is so pretty and quite magical. Certainly a magical shot. Fav. Lovely image... it reminds me of the opening theme to The Wonderful World of Disney episodes... every Sunday night! This could be a magical illustration in a children's book! So very unusual, and pleasing on many fronts--the ghostly lighthouse and the fairies! I like the off-center composition as well. 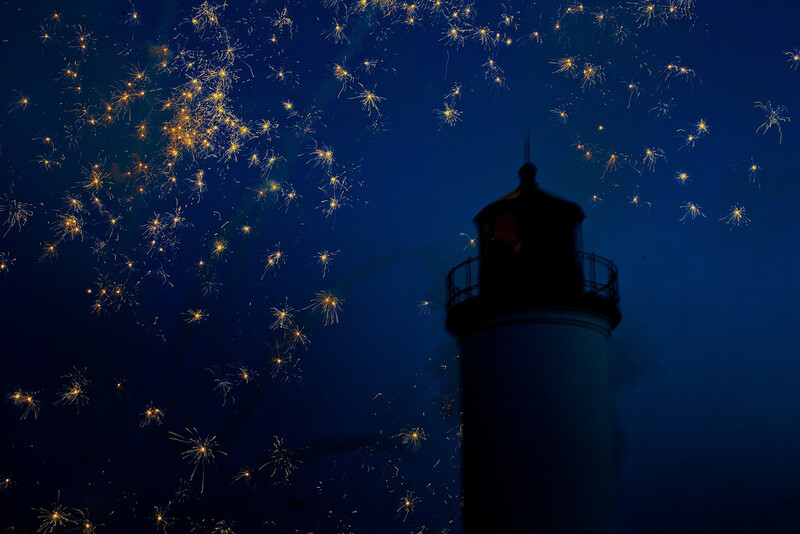 It does look like a hundred little fairies twinkling their way around this dimmed lighthouse. The richness of the dark blues is gorgeous. Instant Fav Taffy!! This is straight out of a fairy tale - pure magic!! I am blown away that you caught these little sparkles amd did not add them later!! Fabulous image - I know where this is headed!! Simply magical! Another fav for you Taffy! They do look like little, glowing creatures! Beautiful!!! Looks like fireflies. Greta shot. Yes, they must definitely are fairy lights - or very large fireflies! Really great capture against that awesome lighthouse. Wonderful mood color. Love your story about the turkey family - what a neat experience. Taffy it looks like snow in summer!! eek..............I know not already!! Love the blue sky and lighthouse in the background. This is lovely, and it does look magical. So pretty!! Looks like Disney Magic!! This is magical, Taffy. FAv! Very magical, especially with the lighthouse in the foreground! Very cool shot! A magical capture! The sparkles frame the lighthouse. Fav. @friend2303 You are so kind, friend! One of the best fireworks photos that I have ever seen. @vickisfotos Thanks for the fav, Vicki! This is wonderful!! It's like the opening to the Wonderful World of Disney- only it's the Wonderful World of Beaver Island! fav of course!! Woohoo! Congrats on #2 for the week! Oh Taffy..so glad this made TT and congrats on #2! Congrats on double TT once again!! Nos 2 and 4 WOW!! You are on fire girl!! Congrats on the TTs, Taffy! Love this shot! Congrats on 2 photos on TT I thought I faved this must have forgotten to hit the fav icon so big FAV! Congrats on the double TT Taffy, very well deserved as always. FAV for this gorgeous image! Congrats on TT Taffy, love how those fireworks look so magical and fairy light. At first I thought you had added them, they are so pretty. Pure magic!!! Congrats on those TT images! You earned those spots! FAV! Congrats on the TT. FAV. Traveling is very difficult for me to see the shots and comment. Very coll capture Taffy! Congratulations on making it into the Top Twenty! stunning magical shot -fav & congrats on TT! That's come out really nicely, amazing the effects you can get without a tripod.